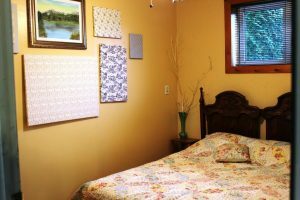 At Gordon’s Park we have a wide variety of accommodations available, whether you are more into roughing it or glamping we are sure to have something that fits your needs. 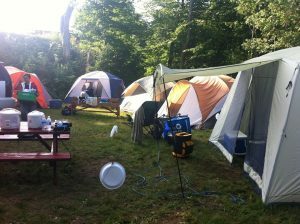 Our accommodations are located in two separate areas, our main campground area and our dark sky campground. 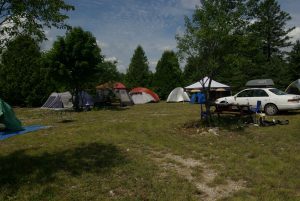 Our main campground is close to the main office and activities available at the park and is closer to various amenities. 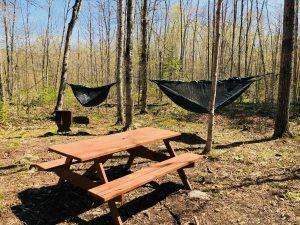 Our dark sky campground is located in our dark sky preserve where you are sure to get wonderful night skies and is ideal for those who want to connect with nature and be a bit more removed. 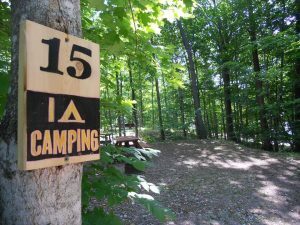 Our main campground is also often nicknamed as our forest campground. 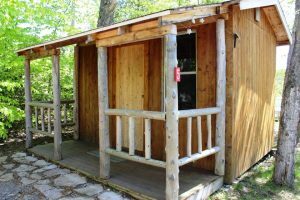 This campground is nestled in among a hardwood forest offering an abundance of space and privacy on each site. 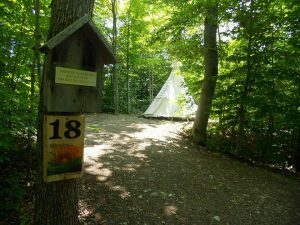 In our forest campground we have camping cabins, tipi tenting, group camping, and a variety of lovely campsites. 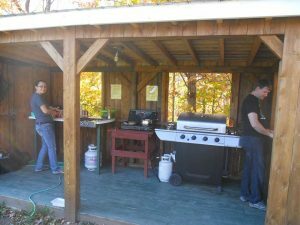 All of our sites include a picnic table, parking for one car, a cook stand and a fire pit. Most of the sites are under a canopy of trees providing shade and comfort during the day. 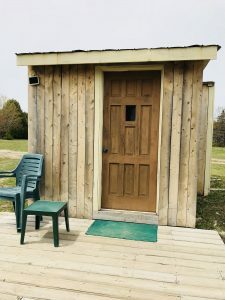 Amenities like the interpretive centre & nature trails, summer kitchen, mini putt, playground & pool are close by and for most of the sites in the forest campground you are able to access the park’s wi-fi. Our dark sky accommodations are located in our dark sky preserve, which is back in the meadows and cedar groves of our property. 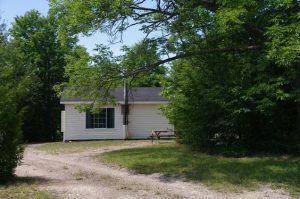 It is a 20-minute walk and 5-minute drive up to the main office and forest camping area. The dark sky campground is home to various campsites, the Milky Way Bunkie and the Stargazing Cabin. There is a communal area in our open field that is great for stargazing and has 360-degree horizon to horizon viewing. By camping in our dark sky campground you are required to follow the rules of our dark sky preserve, meaning that white light and campfires are not permitted. There is a communal fire pit you can use during daytime hours at the main office. We suggest purchasing red plastic filters for all flashlights and lighting. Guests of Gordon’s Park are welcome to use our summer kitchen (located by our main office near the forest camping area), equipped with a BBQ, 3 burner propane stove, pots, utensils, coffee maker, and toaster to make your stay more enjoyable and a little more like home. Please bring your own cooking utensils. The summer kitchen is also equipped with a dishwashing station with hot and cold running water. There are picnic tables and shelter on site. Charging station for devices (located at main office). Eco-showers (located at the main office). Flush toilets and comfort stations (at the main office). Privies located throughout the park. Large seating areas for groups with overhead shelter. Summer kitchen with essential kitchen items (at the main office). Ice, firewood, and basic camping supplies available for purchase in the gift store. We also offer access to some free activities and deals on for fee activities, which are all located by our main office. Complimentary access to the nature interpretive centre & hiking trails. Birding, fishing and biking guides. Access to a free little library. Pay once to enjoy unlimited access to the pool and mini putt.